The Atmos Jump is probably the best known cheap pen vaporizer to own out there that not many people take into consideration. When you see the cheap price of only $59, you may look the other way. Many people look for the cheapest prices online, but when it all comes down to your health, you’d rather pay more money for a better device. This is exactly how other people think when they think about purchasing themselve a handheld vaporizer device such as the Atmos Jump vaporizer. This is the reason why many people never actually want to see the facts when it all boils down to the quality of a vaporizer device. There’s many reasons why you want to buy a good quality vaporizer online. Many don’t understand or know the differences between the two, but we should educate you so you can get a good idea of what people want when they’re buying a new herbal pen vaporizer for sale. There’s two types of heating, convection and conduction heating. Convection heating is when hot air rises from the heating element at the base of the atomizer and blows hot air directly up into the botanical which is hot enough to extract the botanical into vapor. Conduction heating is when a hot coil at the atomizer base is in direct contact with the botanical which is resting directly on top of the coil. Conduction heating is really only for dabbing, oil and wax vaporizers. Convection heating is exactly what the Atmos Jump features and not many people know this cause they look at the price. All the new herbal pen vaporizers being developed are all along the lines of $80+ for a convection herbal pen vaporizer. The company atomizer set the competitive pricing and placed the price tag at $60 for the Atmos Jump which it can easily be set at over $90 to compete with the Atmos Boss or Atmos Orbit which are really popular high quality pen vaporizers. The Atmos Jump has many of those features that you see within those vaporizers. Why Buy The Atmos Jump? The Atmos Jump has been mass marketed online for the last two years and it has really caught everyone’s attention. It is easily now the best herbal pen vaporizer in the world and is going to give the best vaporization period for a new vaporizer for you to use. When you want to use a pen vaporizer, this is the one you’re going to use as the Atmos Jump pen vaporizer is one of the best quality pen vaporizers in the world for you to buy a high quality pen vaporizer. 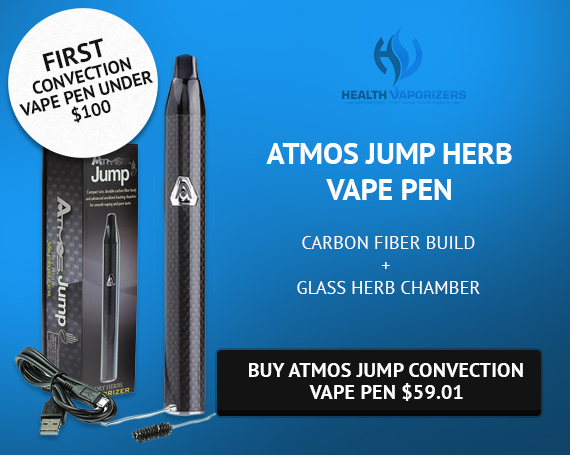 The Atmos Jump has an all-glass-vapor path which makes it one of the top pen vaporizers to use for the price with its convection heating vaporization. It has just one temperature and the design is made out of quality aluminum alloy material which makes it a very durable vaporizer. With a Poly-carbonate heat safe plastic mouthpiece and a strong 1200mAH battery, the Atmos Jump is by far a quality pen vaporizer you need to think about buying when it all comes down to what type of pen vaporizer you’re going to buy and use. The Atmos Jump for sale on many of the online retailer sites, but the folks over at HealthVaporizers.com always seem to have the best prices for every unit. The price is $59 respectively and the Atmos Jump is going to be the go to vaporizer for anyone to use that wants to experience a quality, flavorful vaping experience while getting the most potent and flavorful vapor possible using this high-tech device to use. There’s a reason why the Atmos Jump was a top-rated cheap herbal pen vaporizer and it is the quality heating and durable design that has put this vaporizer on the map with the more expensive vaporizers. It is rare for you to see a good vaporizer that works as well as the Atmos Jump, this is a good quality unit you need to buy when you want a quality pen vaporizer that costs under $60.